Sling for your Arm, Sir? I’m tempted to say that this is our last full day in Singapore but, since our flight departs for Heathrow tomorrow at midnight, I suppose that isn’t really true. Nonetheless, spending several hours waiting at an airport, even the relatively plush Changi airport, won’t feel like part of a holiday day so we’ll go with my temptation. After soaking my left index finger to remove bandage #1 (the blood had soaked into the padding, dried and set like glue) without causing blood to erupt again, we applied bandage #2 and set off under some relatively rare blue skies to investigate more of the downtown part of Singapore. 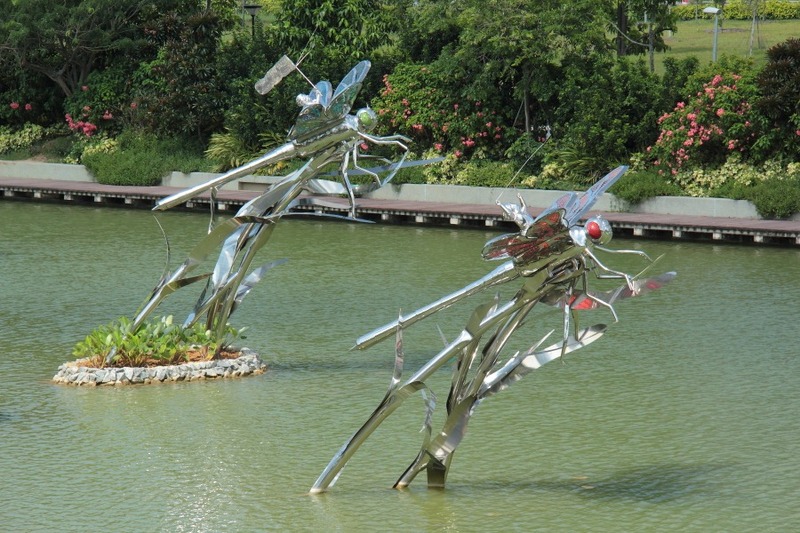 One target was the Gardens by the Bay at Marina Bay South, where dragonflies were a possibility, so I gritted my teeth and took my camera along. We were dropped in the general vicinity by our genial hosts to make our way there on foot, largely to see one of Singapore’s more interestingly architected bridges. The bridge, curved and constructed as a helix, overlooks Merlion Park together with, unfortunately, the blot on the Singapore landscape that is the Formula 1 grandstand. The latter is a little difficult for eyeballs to ignore but can be cut out for purposes of photography. 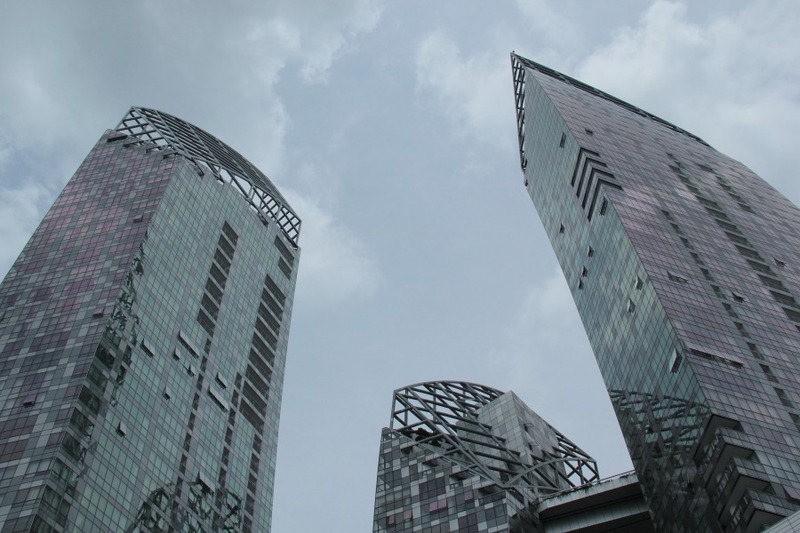 Singapore is clearly rather taken by curved structures, even things that shouldn’t be curved get the curve treatment. 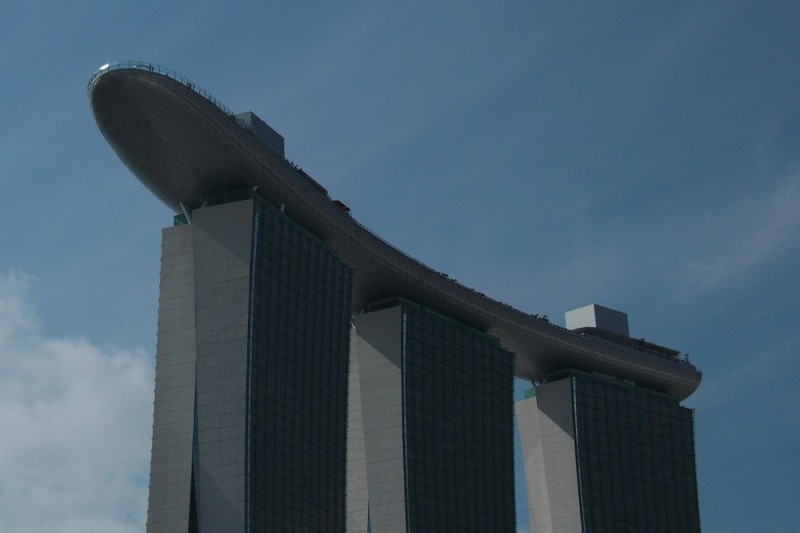 Our next challenge, in order to get to our intended destination, was to find our way through, over or under the spectacular Marina Bay Sands hotel/casino/shopping complex atop which sits a bent boat. We’ve mentioned this before but in rather greyer weather. Now there was some blue sky which makes it look better but I still don’t get the concept of a bent boat. Down near the harbour, they even have some very expensive curved skyscrapers. Very inventive! We weren’t doing well with our challenge. 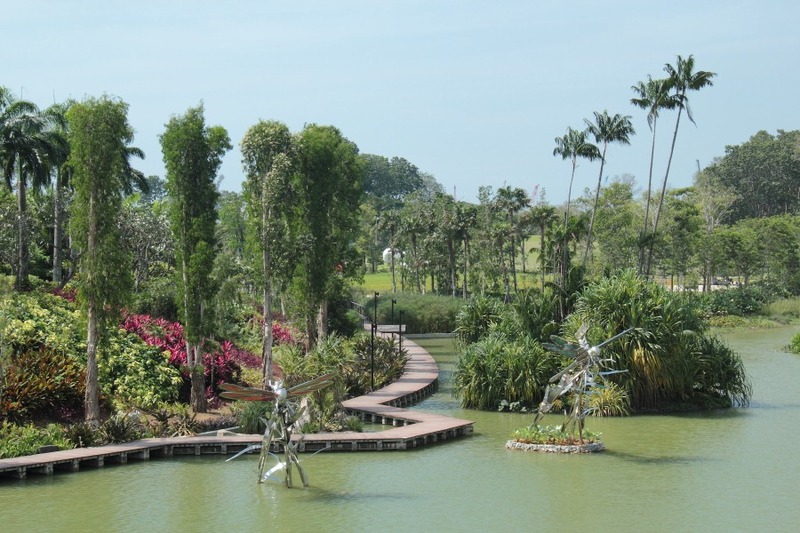 There were two major roads to cross, one to get to the bendy boat hotel which we managed with the help of a pedestrian underpass, and another to get to the Gardens by the Bay. We could see another bridge, straight this time, quite high up but couldn’t find a way up onto it. I asked a waiter in a bendy boat restaurant for directions. The bridge turned out to be rather auspiciously called Dragonfly Bridge. Nice! Much of the south coast of Singapore island is reclaimed land. Dragonfly Bridge eventually deposited us onto a good chunk of the reclaimed land where the Gardens by the Bay have been built and where we found our first species of the day, a very large species called Dragonfly Riders. We did find eight real species around that boardwalk that you can see, though. 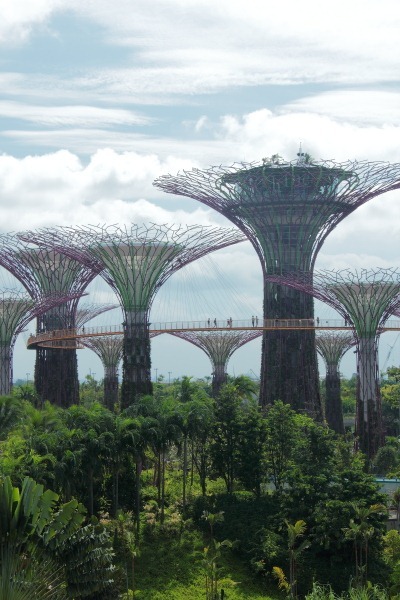 We were eager to get a closer look at the gardens’ most interesting architectural feature, the so-called Supertrees. 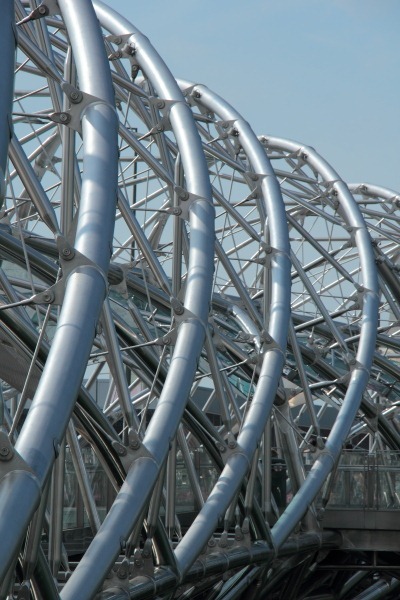 Once up close, we saw that they are effectively massive trellises, the trellis work being constructed of interlocked tubing around a central concrete core. Being new, the planting at the base of the trellis work is young but I suspect they’ll look very impressive in a few years time after some growth – quite a lot of growth. As well as the elevated walkway weaving between the trees, there’s a restaurant in the top of one of them. In need of some refreshment, we had one must-do touristy thing remaining without which no visit to Singapore would be complete. 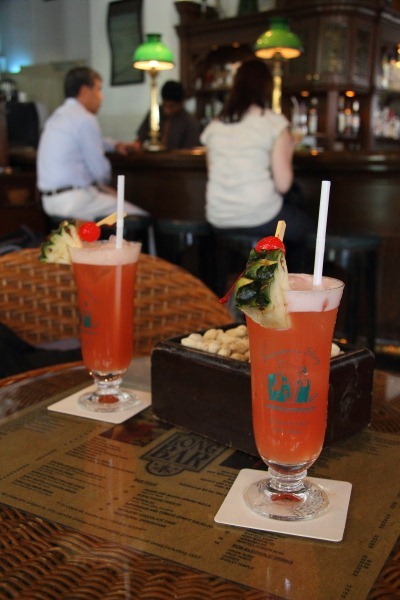 The reputation of the Long Bar at the grandiose Raffles Hotel precedes itself, together with its famed Singapore Slings. My injured arm could do with a sling, after all. 😉 We hopped on an MRT and went to play serious tourist in search of the two most expensive drinks we’d ever have bought. It was Saturday. There was a queue at the door waiting to get in. Movement was less than obvious. I was on the point of muttering, “fudge this, let’s go” when a suited gentlemen approached and ushered us to a table. The tables are all equipped with roasted peanuts in the shells. The shells are traditionally simply discarded on the tiled floor. 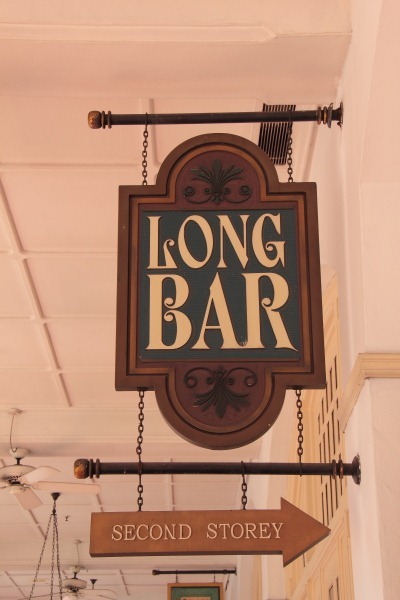 The Long Bar is about the only place in Singapore that you can, indeed are expected to, drop litter without being arrested. 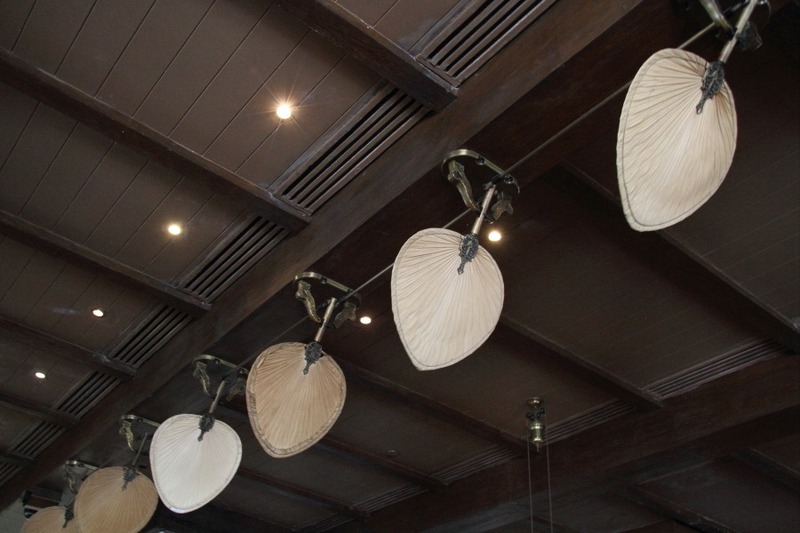 There are lines of small fans in the ceiling oscillating back and forth very slowly – so slowly that they are completely pointless but they do add to the still steamy atmosphere. “Bring back the original punkawallas”, I say. A menu arrived. We’d been told not to look at the prices or the bill, just pay it. Ignoring this sound advice, I now discovered the purpose of the discarded peanut shells on the floor: they are to soften your landing on the hard tiles when you faint. At least you can choose your preferred gin so, once I’d picked myself back up out of the peanut debris and brushed myself off, I ordered two Bombay Sapphire Singapore Slings at S$28 (~£16 or $25) each. They eventually arrived in glasses with slightly warm stems/bottoms, though the drinks seemed cool enough. Turnover is so brisk that the glasses have always only just been washed up, I imagine. We sipped luxuriously and enjoyed our moment of tourist frivolity. Expecting to receive a bill for S$56, I was a little taken aback to be faced with a total of S$65-ish. 10% service charge (for which, incidentally, I’d expect a cold glass) and 7% GST (their lower version of VAT) had been added to the menu price. I picked myself up out of the peanut debris again. 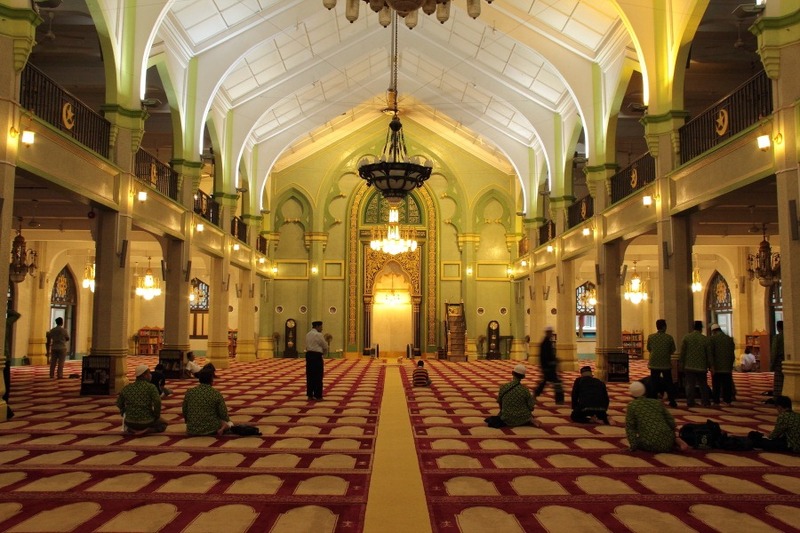 Pleasantly lubricated on the inside and with a much lighter wallet, we made our way home via Arab Street and yet another temple in the form of a Muslim mosque. Francine went inside; I declined and got lubricated on the outside by the tropical thunderstorm which broke. The only waterproof that makes sense in the Singaporean climate is an umbrella, which we had; anything more and you’d steam like a jam sponge. Would they have been cheaper with Gordon’s!! and where’s the photo of you taking your 50p sips?? The extra money is rather like adding insult to insult….